If you’re the type that’s always checking the time while you sleep, you’re probably aware of how such incidents can have a negative effect on your routine sleeping pattern. Just the mere thought of having to flip and look over your shoulders has driven an untold number of people to get up earlier than what is necessary. Alarm clocks have existed for quite some time now, but projection clocks give the traditional ringers a boost on many different levels. 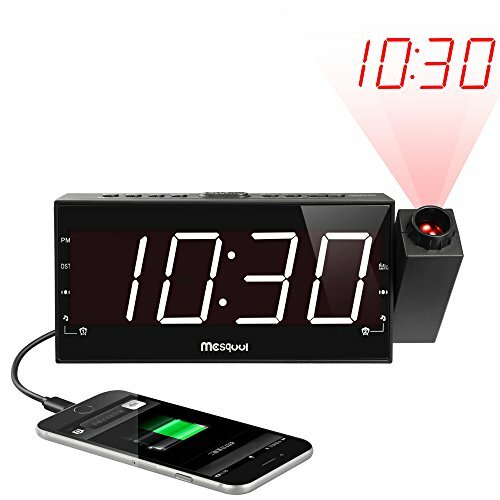 The eight reviews below give detailed information on the best clocks in this category and things you should know before going with any product. It’s about time that you let your evening rest mean just that. 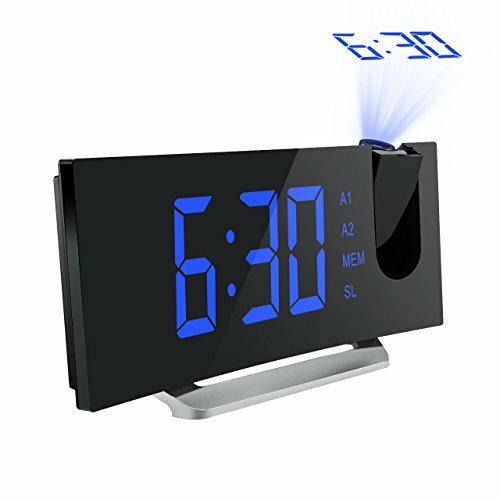 What is the best projection alarm clock to buy in 2019? Projection clocks typically do much more than just tell the time. Because of this, the following comparison list has been made for you to get a quick peek at the basic stats associated with the products. Checking the time has become increasingly reliant on smartphones, at least for some in recent years. But there’s one problem with this: You must pick up the phone and activate it before the time is shown. Clocks with projectors eliminate this task, and so does the Mpow. But there’s something your phone could find benefit from with it also. Hook up your USB cable and connect it to the slot that’s available on the clock to get a fast charge completed in less than an hour (when the battery is low). The clock’s battery is lithium-based, so when it’s fully charged, the power transfer over to other electronics to give it more runtime. The point of having these clocks is to decrease your movements when you need to know the time. If that’s important for you, take note that several buttons will need to be pressed when the alarm goes off. It’s something that’s exceedingly difficult to do in a dark room with little light. You’ll stumble the first few tries probably, but might should become accustomed to it after a while. Still, it would be much better if there was only one button to be activated. On a bright note, doing this could have the unintended result of waking you up on time! 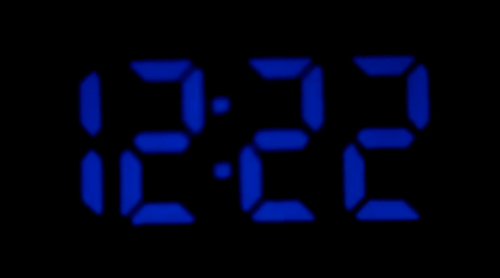 On the surface, the Electrohome Projection Clock sort of looks like a phone, with its display and keys placed to the right and a slanted projector immediately to the left. It adds a nice decor to any bedroom with modern furniture and does a good job at what it’s advertised to handle. There are some great attributes under this one, of which has given it one of the highest recommendations on the list. Have you ever operated a projector for watching movies? If so, you know the importance of focusing the clarity of light on the screen it’s targeted at. If not done, the film will look blurry until dials are moved that add more resolution. Every time the projector or screen gains or loses distance, this must be corrected again. 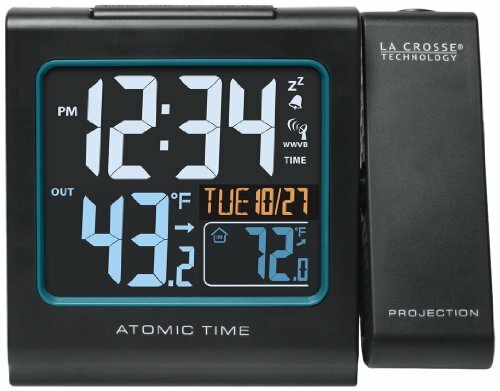 The Electrohome operates the same way when it comes to displaying the time. A common complaint among many who have used similar devices is the blurring that occurs on the ceiling. It may force you to place the clock in awkward position just to be seen and read without any eye strain. This can be fixed quickly. Just change the clarity on it’s configuration and the haziness will disappear, showing crisp numbers for you to read with the lights on or off. The Electrohome is recommended for people who need something that will be moved around in the room quite often, and don’t want to put up with a clock that doesn’t work in a way that was anticipated. With this clock, you won’t be placing it in the storage shed anytime soon. 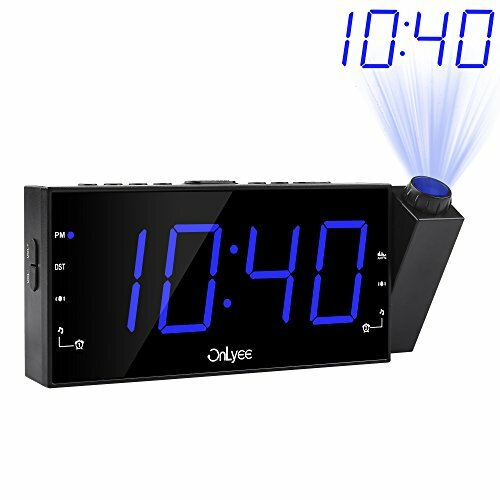 OnLyee’s Projection clock has a brilliant blue screen on both displays. 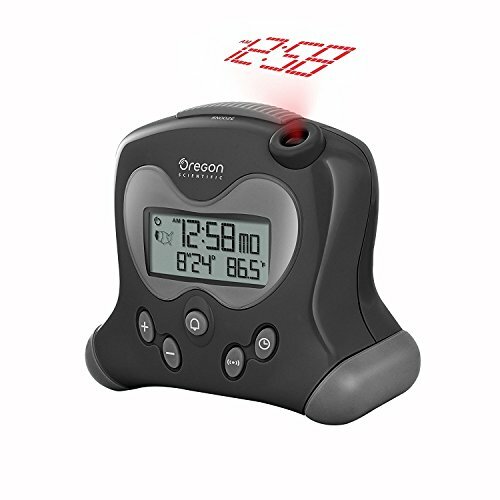 It makes it easy to tell the time in the dark and is especially recommended to those with slight vision impairments. If you have trouble seeing without your glasses, you’ll probably still need them but may find the device useful for waking up on time. Here’s how. When you’re set to go to bed, the clock has a projection that beams it’s light towards to ceiling. The position can be changed a little by simply turning its light. You can also flip it in the opposite direction but still get the same angle. This is important, since you may want to place the clock in an area where doing such a thing would be impossible with other products that don’t have this feature. But there’s also some improvement to be made. If you plan on using the radio as well, you could end up frustrated by its lack of clear sound. It can be heard but it quite low, even when the volume is turned all the way up. And the brightness is also a weakness. It’s a little too bright, which means that light sleepers with sensitive eyes might find themselves out of luck. Even at the lowest brightness point, it’s still illuminating to the point where most items in a small room would be clearly visible. But if these things are a non-issue, consider the OnLyee when you’re ready to go a step further than using the alarm clocks of old. It has USB dock and headphone jacks, so hook your speakers up if things look promising but are worried about volume control. Larger is better, especially with alarm clocks. Getting a bigger display equates to less time spend squinting to make out the time when you hear the alarm after your second snooze. The Mesqool Clock keeps the list consistent with its beautiful screen and reflection, sending out great luminosity in a package that’s surprisingly lightweight. One of the best features is the radio. There are 20 preloaded stations included with it once setup is done. And if things are too bright for you, the device has three lower options to pick but deviate in brilliance enough to where the room will be pitch black, save for the numbers above. But no product is perfect, and the same can be said for the Mesqool. The radio speaks is very small and produces a less-than-average gain than its competitors when the alarm is sounded. And going back to its weight, it’s too light at times. For example, there’s a USB slot but when the phone is plugged in, will cause the clock to topple if the charging cable is moved at the slightest pull. You could risk taking on damages to the entire clock, so make sure there’s a support for the device somewhere if placed on a small table or dresser drawer. Overall, it’s a solid buy for any consumer that need a new room alarm system but favors the projector over the other supporting features. 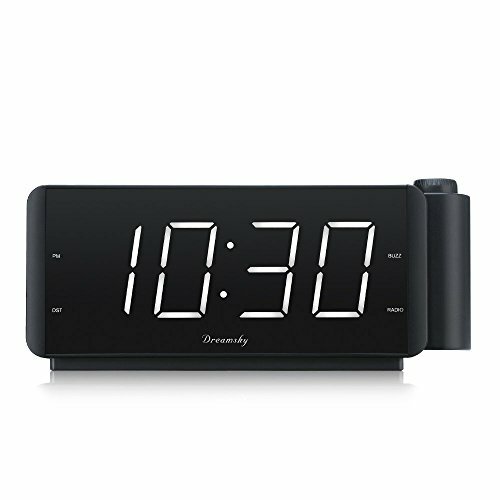 The DreamSky Projection Clock is another in the line that’s suggested when fast alarm action is a requirement. While other products sometimes create difficulty in turning the sound off, this piece benefits with its features that are focused on getting you back to sleep without looking like your playing a handheld video game with the configuration. In other words, pressing snooze shuts off the noise until the next quick napping session is over. You can also change the music you hear when it goes off. Either use the standard ring, switch to a beep, or even try the radio that’s set to play FM broadcasting. Try to be careful how you handle this clock. If it’s dropped repeatedly, it’s probably going to break eventually, no matter how high it falls from. And battery users will be especially annoyed when they find out how hard it is to get the lid open. It’s probable that you’ll scratch the machine when you do open it up. But it’s something that might be done anyway since having a backup is important for unpredictable power outages. See how much you’ll like the DreamSky when you need something that helps give quick control of the pesky but mandatory alarm system. The Ambient Weather RC-8401 would be a good alarm clock to take out year round but blend very well with colors that match popular holidays, such as Christmas and the Independence Day. As the display is shown, the colors will change according to the temperature outside. Along with this are gauges for barometric pressure and the ability to get a forecast on weather events up to 48 hours ahead of time. It’s safe to say that you’ll have a good indication of what the weather is going to be long before you get up from the bed. Get ready to use up a lot of batteries. Other projection clocks typically take AA or AAA, at a quantity of about two to three that are needed. Not this one. You’ll need five batteries if you’re adamant about saving all the settings you made in case of an abrupt power outage. This can get pretty expensive, so you should think about acquiring rechargeables if you like to listen to the radio during blackouts, blizzards, or severe thunderstorms. And setting up the configurations must be done in the dark when the alarm sounds. Regardless, this isn’t blundering of any kind. Try out this Ambient Weather product when weather indications succeed your ability to use a smartphone to get the same forecasts. Lastly, it’s an excellent tool to have for anyone that lives in a hurricane-prone region. 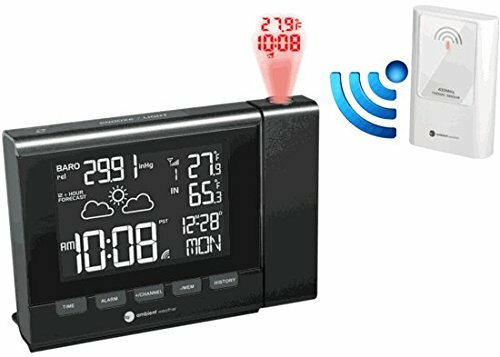 If you remember how older alarm clocks looked and miss the nostalgia but don’t want to have something inundated with outdated features, then the Oregon Scientific is the right tool for you. It’s often rated as one of the best projector clocks sold on the market by consumers. 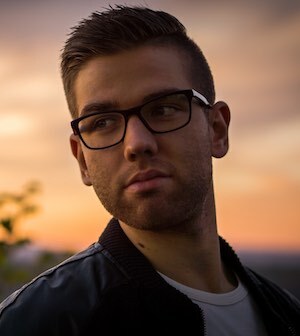 The atomic radio signal is very strong, connecting in the unlikeliest of places. You could even place it in a closet and have a good chance of getting an accurate time signal. And the standby buttons is a jewel. Other machines often require too much work for the user to do overtly simple actions. There’s only one on and off button here, so the alarm goes off quickly and doesn’t necessitate any lengthy operations in the dark early hours of the morning. If you like the sleek modern look of the devices that were previously reviewed, the Oregon Scientific is lacking in this department. It’s stocky, small, and quite childish looking in appearance (at least it could be to some people). The buttons are thick rubber pieces that protrude from the clock, further giving it the impression that it’s some ancient relic that somehow what given the ability to perform the advanced tasks. If these things are unimportant, then the RM313PNFA is advised by incorporating nearly everything that other projection clocks do wrong. Give it a try if they want to see just how deceiving looks can be. Last but not least, the La Crosse Technology 616-146 ends on a strong note, functioning the same way as the others but amplifying to power behind the projection’s image. You could place this in a large room and get a legible image of the time from the opposite wall. It’s also pretty small. There shouldn’t be a problem with you finding a spot next to the bed once everything is configured. A temperature gauge is available for the weather, and you won’t even need to push anything to get a reading from the projection. The focus here is on minimizing your use of hands, so it’s highly recommended for anyone suffering from disabilities where their movement is limited when lying down. As for negatives, there’s a big one and it also centers around the projection. It doesn’t update the time when pressed. Yes, you will have to look on the display in order to do it. It sounds almost like a bluff, as this one aspect is what separates clocks of this type from more rudimentary time telling gadgets. You could still find great use for the temperature gauge, however. It goes outside, so weather forecasts become a little bit more personal and much more accurate at it’s best. Here are some brief pointers you should know about before you finalize your decision of what clock will end up in your bedroom. Have you ever seen a laser pointer or projector of some sort? The light’s image gradually fades as the distance is increased between the point where the light stops until it’s not there anymore. 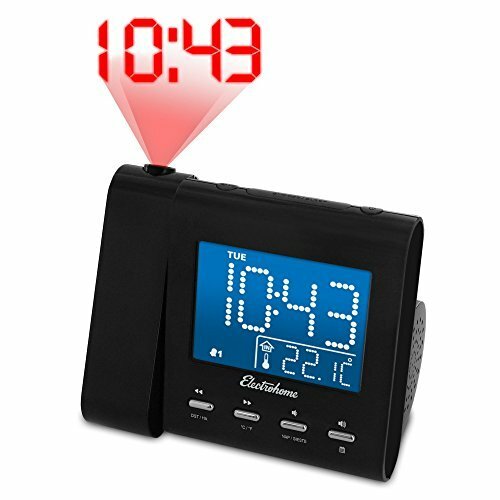 Projection Alarm Clocks send light towards an object and reflects it back in the direction of the viewer. A large bedroom or living area with a high ceiling could have issues with reaching its source and remain visible. Blurring is bound to occur with anyone projector over a long distance, so if you live in a house that has large bedrooms, consider getting a clock that will enable you to focus the image reflection so that it can be read. Whenever this feature is included with a product, the brand will typically inform the consumer of the attribute since it’s a high selling point. How do you Charge your Smartphone? This is a question that few people may ask themselves before shelling out on a projection clock. Take a look at how many wall outlets you have in the bedroom. Are they close to your bed stand? If so, do you use them for charging your phone or other electronics that are needed? Using a hypothetical, imagine that you have two plugs for your smartphone charger and another for some other important purpose. You would probably unplug the phone charger to make room for the clock. If the clock has no USB port, you could find yourself in a conundrum from searching for additional outlets. 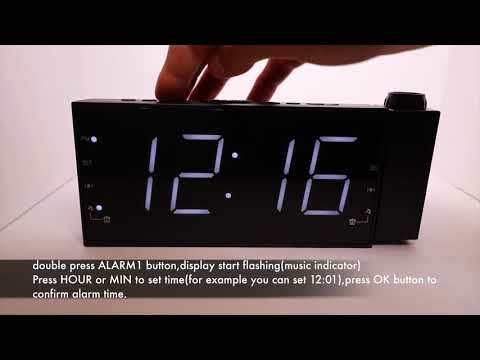 There are numerous workarounds to avoid this, but try to remind yourself that a projection clock would be well served with such an inclusion, particularly if you enjoy using the phone while you’re laying in bed. While this is debatable, one could argue that projector clocks with weather-reading instruments are slightly outdated, depending on the amount of tech you have lying around your home already. It’s easy to know what the weather’s going to be during the mornings when there are phone notifications, 24-hour weather stations, and smartwatches. What makes projection clocks stand out when there’s so much competition? Think about the last time your power went out. Were you prepared? Did you have access to a radio that was fully charged with batteries? How could one receive by-the-minute weather readings if there’s no power? The awesome tools mentioned earlier become increasingly useless without power. Projection clocks will usually have at least one broadcasting method (AM or FM) and contain either lithium or alkaline battery compatibility for backup power. And even if the weather isn’t a major concern, the clocks could be more accurate when devices are featured that help the user get a better reading of the area they reside in. To wrap things up, it must be stressed that projection clocks will generally all perform the basic need of a working alarm. All features combined is what determines the great from the not-so-great. With this in mind, the Mpow and OnLyee models rest on the highest shelf with their easy configurations and focus on minimizing how often they’re needed when it matters the most (when you’re sleeping). But don’t forget about the others. They are just as effective and possess numerous specs that shouldn’t be ignored. Just remember to choose the one that will put you in control of your wake up routine, and not the other way around.